This is a take-off on a Dummy load that I’ve built in many different forms over the years. 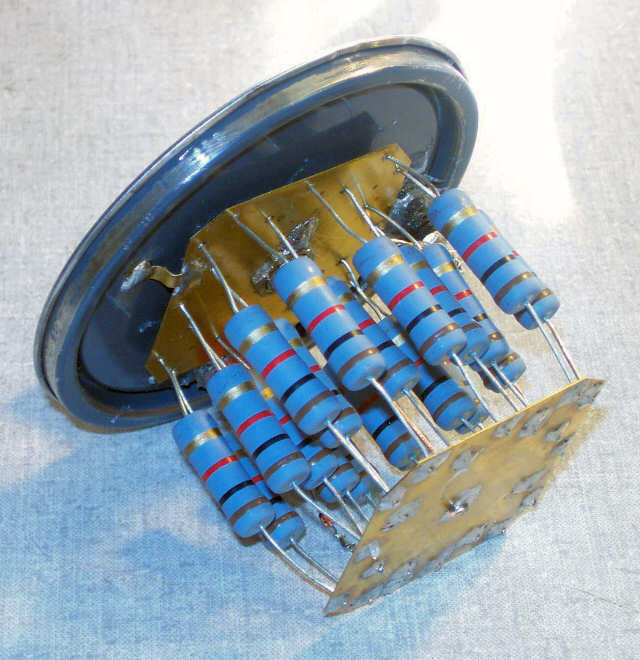 It uses a number of non-inductive resistors in parallel to achieve 50 Ohms over a wide frequency range. It is submerged in oil to allow somewhat extended operation during tuning or repair procedures. The advantages are: (1) It’s cheap, (2) It provides a very pure 50 Ohm resistive load through 30MHz and beyond, (3) You can easily add power measurement and rig testing capability. This one is conservatively designed for rigs that have power output levels up to 130W, such as the Kenwood hybrid lineup. I built it into a one-quart paint can, readily available at Ace Hardware for about 89 cents. I’ve used it for about a year now. A few hundred of your service rigs that you have sent to me have been loaded up into this dummy, and it is still like the day it was built. I know, because I had to take it apart to take these photos! It still measures 49.9 Ohms, even after all those rigs, all that power! This entry was posted in Education, Fun Stuff by N3LRG. Bookmark the permalink.